Info Jog down the runway and leap over the crossbar, taking care not to knock it off its supports. You can set your own starting height, but this is increased with each successful jump. When you fail to clear the crossbar three times in succession, the last height you successfully cleared will be recorded as your score. High Jump is a Field Athletics Event that appears exclusively in the Wii version of Mario & Sonic at the Olympic Games. It is set in the National Stadium. The objective of the event is to clear the cross bar at the greatest height possible. Amy can be seen competing in this event in the game's opening, with Toad and Espio as referees. The starting world record for this event is 2.45m, while the starting Olympic record is 2.30m. 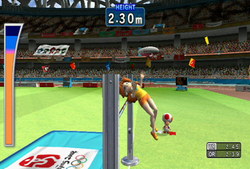 In this event, the player has up to three attempts to jump each height that the bar is set at, being able to move onto the next height after the first attempt that the previous height is cleared at. The player must initially set their height using either or , and then must use to confirm their selection. The lowest height the player can attempt to jump is 2.20m, and the highest 2.60m, with increments of 0.2m in between. Each attempt starts with the announcer calling the character's name and attempt number, before allowing the player to swing the Wii Remote and Nunchuk toward sand away from each other in a clapping motion to appeal to the audience and allow them to jump higher. The player's warm-up level is also shown at this point by the number and color of musical notes that appear around the character's head, which, depending on the amount, allow them to jump higher. The level increases the more jumps the player performs, and goes from one blue note to two green ones and then three on to four red ones. Once the attempt starts, the player must shake the Wii Remote and Nunchuk alternately to build up speed an jump power, indicated by a meter on the left hand side of the screen which corresponds to the jump area. After a while, the player's speed will be locked, which will allow them to prepare for the jump. As they approach the bar, the area corresponding to their jump power will be visible and as they approach the end of the area, the player must swing the Wii Remote upwards. Failing to do so will cause the character to run past and the attempt to be marked as a foul, meaning that the player must try again. The closer the player jumps to the end of the area, the higher they will jump, with doing so exactly at the end causing them to receive a "Good!" rating. If the player performs a successful jump, they are also able to adjust their character's body angle in the air by swinging the Nunchuk upwards, allowing them to reach a slightly higher height. The attempt will be a success if the player either makes it right over the bar or if it is touched but remains up, but will receive a foul if they knock the bar down. The player will keep jumping until either they knock the bar down on all three attempts or clear the maximum height of 2.60m. The character who cleared the highest bar at the end of the event is the winner. This event uses the Wii Remote and the Nunchuk. In this event you'll run and jump over a bar at least 2 meters high. As the bar is raised higher, adjust your body to avoid hitting it in mid-jump. This event uses the Wii Remote and the Nunchuk. You can set the height of the bar with up and down on and enter with . During the athlete introduction, swing the Wii Remote and Nunchuk side to side in a clapping motion to draw audience applause. Alternately shake the Wii Remote and Nunchuk to run and build up jump meter power. The more blue power in the meter, the easier it is to control your jump. When "SPEED LOCKED" appears, stop shaking the controllers and raise the Wii Remote to jump. The closer you are to the blue area, the higher the jump will be. As you perform jumps successfully, you will start to warm up. Your warm-up level will appear as the number of musical notes above your head before the event. Sonic: Sonic's second mission is to place second in the event. Daisy: Daisy's fifth mission is to clear the bar at a height of 2.20m using only her jump power twice. Yoshi: Yoshi's second mission is to clear the bar while jumping from the blue area twice. Tails: Tails' second mission is to clear the bar after jumping from the blue area. Amy competing in High Jump. This page was last edited on April 21, 2019, at 20:56.